The Users Sitemap WordPress Plugin makes it easy to create a users/authors archive for easy browsing with just a few clicks. As well as a human browsable archive of users the plugin also activates an XML sitemap for users of your WordPress website to be listed so search engines can find parts of your website it struggled too before. Including users/authors of your WordPress website in sitemaps is currently not possible with sitemap plugins (at the time of writing) due to the complexity. 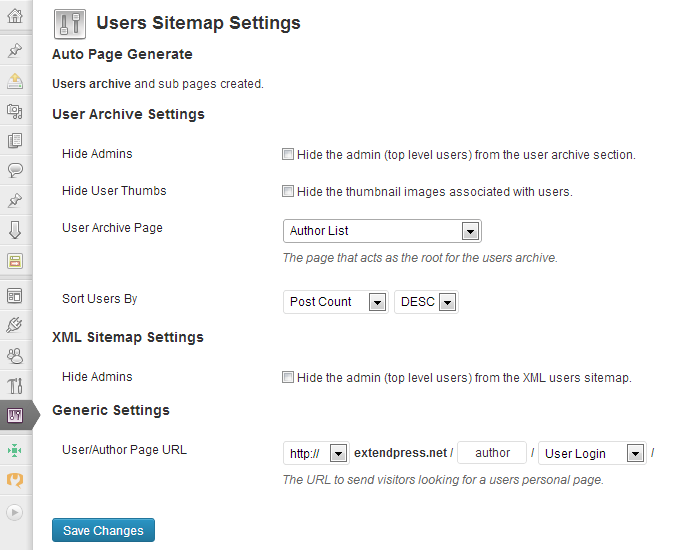 This Users Sitemap plugin comes with one built in, activated with the plugin after installation. All you need to do is submit the sitemap to Google and the other search engines for them to keep checking to see if any new users have signed up or changed there profile picture. Just like CodeCanyon, Facebook and many other user orientated marketplace/websites, searching for people is much easier when you have an archive to look inside of. The user archive that is easily created with a few clicks in this plugin creates a section of your website that you can customize that allows visitors to search for members by the first character of there username. Allowing Page Rank to flow smoothly through your website is essential for pages hidden away to start ranking for important keywords. This User Sitemap plugin makes it easy for you to ensure that author/user pages are no further than 3 links deep away from the home page (important for SEO). The XML sitemap ensures that as new author/user pages are activated the search engines know about them as easily and quickly as possible and start ranking straight away. The settings page allows you to tailor the plugin to your needs, from customer author page URL’s to hiding admin users. Styling is also easy and an example is included with the documentation. This plugin works great with the free WordPress Plugin User Photo. Using the two together you can create a brilliant graphically rich user/author archive for the search engines to crawl as well as visitors to your website. All major browsers. Minimal styling applied, id’s and class’es used as much as possible to allow for easy customization. Looks and feels fine straight out of the box. Use the Comments or FAQ system above to ask questions if you get stuck and we will try our best to get back to you as soon as possible.